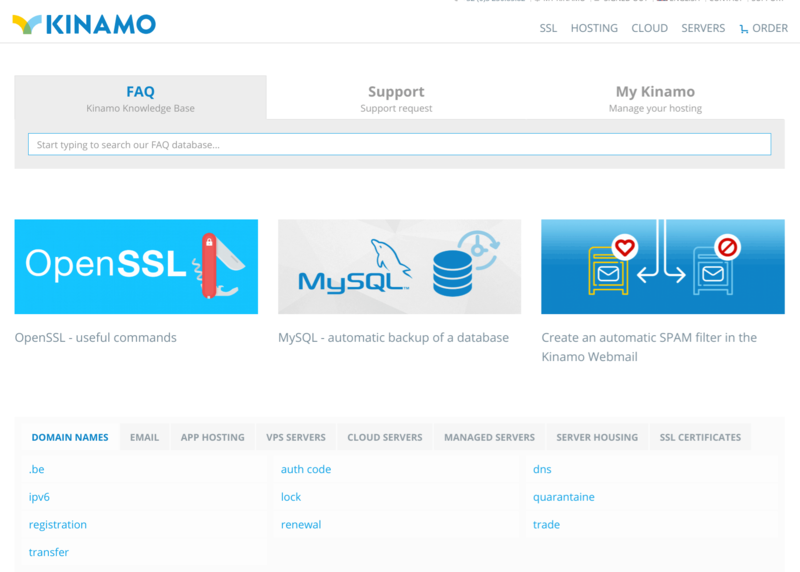 Kinamo Review 2019: Is Kinamo a Good Hosting? Since 2003, Kinamo has been one of the best Belgian hosting companies. With an impressive portfolio of partners and customers, this provider is one of the pace-setters of the web hosting industry. 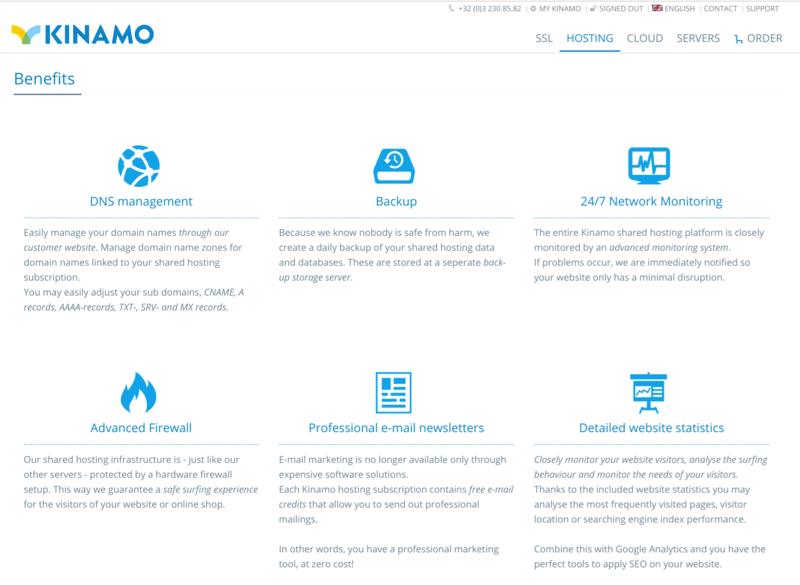 Kinamo has been one of Belgium’s prominent web hosting services since it began boosting the online presence of customers nationally and internationally in 2003. Clients the world over have relied on Kinamo for registration and control of domain names, cloud hosting, cloud servers, virtual servers and much more. From all indications, Kinamo has shown no restraint in delivering quality hosting services to their customer base of over 500, with more joining the fold all the time. With a wealth of experience, Kinamo’s customer portfolio includes web developers and designers, communications giants, emerging and established businesses, and multinationals. With partners like Dell, CentOS, Debian, VMware, Cisco, and EMC, Kinamo is one of the pace-setters in the web hosting space. The Kinamo website can be switched between English, French and Dutch languages. Kinamo’s servers come with 2 Gigabit Ethernet connected to Cisco Catalyst Gigabit switches so you can be sure of high-speed internet. Another amazing feature of the hosting service is the VMware Cloud Servers (a leap in the server visualization segment) offering superior stability for both public and private cloud servers. This provider prides itself on the installation, configuration, and monitoring of customers’ servers. It also offers transparent licensing for Veeam and Microsoft solutions. The company also offers top-notch security for your domains, with excellent hardware firewall infrastructure coupled with the option of choosing a standalone and more flexible firewall. For beginners, the amazing interface will glue you in, and you get easy installation scripts for CMS software such as WordPress, Joomla, Drupal, and Magento. You can also adjust the CNAME, TXT-, SRV-, AAA and MX records for your hosting. Unlike many other hosts, Kinamo creates daily backups of hosting data and stores them in a backup storage drive. After looking through the long list of its packages, I came to the conclusion that Kinamo’s prices are reasonable enough. Not cheap, not expensive, but somewhere in between. No hidden charges are attached to any plans (which is good), but there are no warranties (which is not so good). Payments can be made by credit card and PayPal. Kinamo’s support system is excellent. Inquiries and complaints are addressed within minutes, which is much better than many of the web hosts I have encountered. There is also a knowledge base on the Kinamo website. Kinamo is a good choice for beginners and expert webmasters who are searching for a professional and reliable hosting platform for their businesses. Wondering how Kinamo stacks up against other Web Hosting companies? Enter any other Web Hosting company and we will give you a side-by-side comparison.